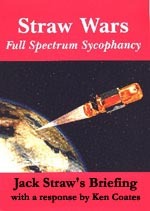 Straw Wars includes the verbatim texts of the statements by the Foreign Secretary, with point-by-point rebuttals. It also includes the full text of the United States Space Command's Vision for 2020. This deadly serious document speaks very candidly about what is behind the impending repudiation of the Anti-Ballistic Missile Treaty, and the wholesale violation of the Outer Space Treaty. The salient points of these Treaties are also reproduced.